LabSafe GEL Blue™ is an enhanced protein stain based on Coomassie dye that offers unsurpassed sensitivity and rapid band visualization. 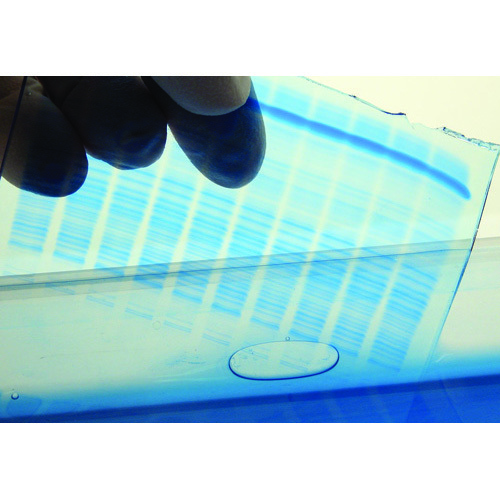 LabSafe GEL Blue™ is supplied in a ready-to-use format that is added directly to protein gels following electrophoresis after a brief wash step. LabSafe GEL Blue™ is an ultra sensitive stain that is able to detect as little as 4ng protein (see figure below). Protein bands are visible in as little as 3 minutes, with maximal staining achieved in an hour. The figure shows that LabSafe GEL Blue™ can detect protein levels as low as 4ng BSA. 60 to1000ng BSA is detectable in 5 to 10 minutes, and the low levels of BSA (<8ng) become clearly visible when washed in water. Tesch, D.M. et al (2018) Uniaxial Diffusional Narrowing of NMR Lineshapes for Membrane Proteins Reconstituted in Magnetically Aligned Bicelles and Macrodiscs. Appl Magn Reson. Roberts, M. et al (2018) Skeletal muscle mitochondrial volume and myozenin-1 protein differences exist between high versus low anabolic responders to resistance training. PeerJ Prepr.doi.org/10.7287/peerj.preprints.26933v1. Riascos, J. J. at al ( 2016) The seed biotinylated protein of soybean (Glycine max): A boiling-resistant new allergen (Gly m 7) with the capacity to induce IgE-mediated allergic responses. J. Agric. Food Chem.DOI: 10.1021/acs.jafc.5b05873.